The Macalester College Observatory is a science-grade facility featuring a 16-inch reflecting telescope, custom-designed and built by DFM Engineering. This instrument points and tracks with repeatable precision. This is not just a telescope for looking at pretty objects; this is a telescope that can be used for meaningful scientific research projects. In many respects it looks and acts just like the large (2 to 4-meter) telescopes at the national facilities (e.g., Kitt Peak National Observatory). It is computer controlled and computer driven so that at all times you can know exactly where the telescope is pointing and exactly how well the telescope is tracking. 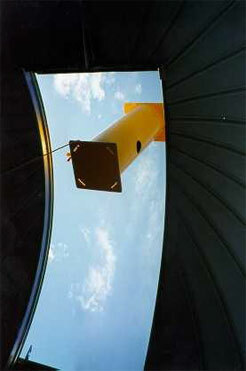 Also, the observatory dome is automated so that the telescope is always pointing out of the slit. The operating system is similar to those used to operate large telescopes so that students trained on this system will experience observing just like at a national facility. We use a science-grade CCD camera (a microscopic layer of silicon divided into rows of pixels) to image the night sky. Such a camera is necessary for any decent astronomical imaging in our urban site; not only is the CCD very sensitive to scant amounts of light, it also has additional features such as co-adding several images to improve the signal-to-noise of an image and dividing out sky background light. The telescope and imaging system are computer controlled from a dedictaed astronomy computing laboratory on the fourth floor of Olin-Rice Hall. This means that we can avoid the freezing cold Minnesota nights outside. A dedicated data storage facility is in place to allow archiving, and multiple new Mac OS X computer systems are used for analysis. 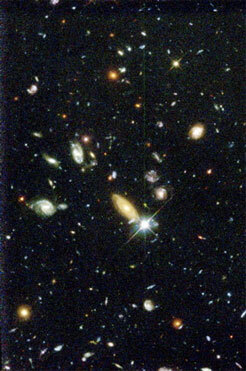 NASA image of the Hubble Deep Field, imaged in f450, f606, and f814. Copyright NASA.